Prof. Wole Soyinka, has called on Nigerian President Muhammadu Buhari, 74, to reveal the condition of his health after spending nearly two months in Britain on medical leave. Buhari and Soyinka Soyinka, who spoke in an interview with AFP at Paris Book Fair weekend, also said indigenous people had a right to assert themselves as a distinct people, even within a political and geographical zone anywhere in the world. “He’s ill, there’s no question, and I wish for heaven’s sake that people in public positions would just be honest. “Illness is part of our existence. Buhari owes it to the nation and I don’t know why he and his advisors are being so coy about it,” Soyinka said. Soyinka, who also noted that US President, Donald Trump, exploited “latent xenophobia” to reach the White House, said a people had a right to agitate for self-autonomy within a geographical expression. He was obviously reacting to the agitation for declaration of independent state of Biafra in the South East of Nigeria. He said: “It’s not the real estate for me that defines a nation or a people, no, it’s a history, a culture. What is a crime within an artificial entity like Nigeria? You have states being created which are not viable.” Biafra unsuccessfully fought for independence in a brutal three-year civil war — during which Soyinka was imprisoned for nearly two years over allegations of espionage. Separatist sentiment has grown since the leader of the Indigenous People of Biafra (IPOB), Nnamdi Kanu, was arrested in October 2015, sparking bloody clashes with security forces. The military denied an allegation by Amnesty International in November that security agents killed some 150 Biafra protesters in the past year. Soyinka said: “I cannot accept the notion that people have a right to kill other people because they want to assert their identity… It it doesn’t cost anything to recognise it.” Ironically, IPOB threw its support behind Trump’s presidential campaign in the belief he would recognise their independence movement. Soon after Britons voted to leave the European Union in a referendum last July, the group pushed for its own version of “Brexit” from Nigeria that it dubbed “Biafrexit”. “He played to a latent xenophobic streak which exists in all societies including mine,” said Soyinka, who renounced his US green card upon Trump’s victory in November over the Republican’s anti-immigrant rhetoric. When I see that kind of conduct… to gain power, I’m completely revolted.” Soyinka, who was awarded the Nobel prize for literature in 1986, said further: “To me a horrible moment was to watch hundreds of thousands of people actually applauding when (Trump) uttered these sentiments” during the election campaign. “I’m against the erection of walls, especially in people’s minds,” the white-haired professor added. 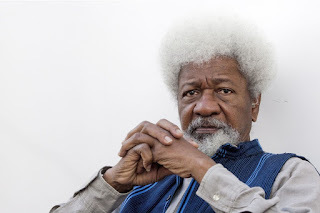 I’ve never made any bones about it, whether it’s happening in Nigeria” or elsewhere.” Soyinka recalled when in 1983, faced with a steep drop in oil prices, the Nigerian government, “to cover up all its problems, decided to expel aliens”.